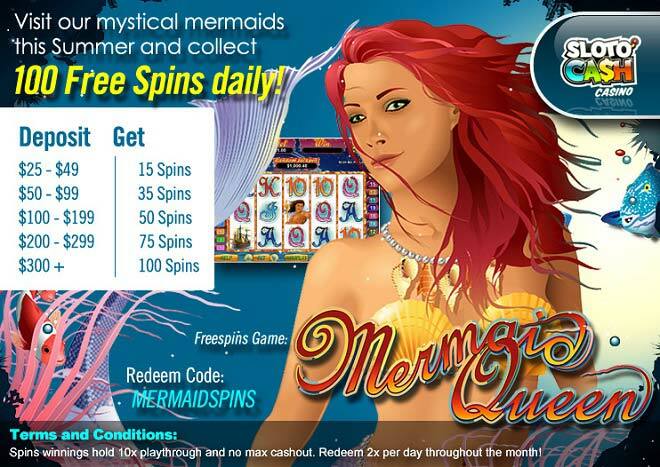 100 Free Daily Mermaid Spins This Summer! Learn to explore and love the world around you this July and become whatever you want to be; even if you dream of cooling off being a mermaid! Or how about spending your warm summer days and nights in the company of the queen of the sea with up to 100 Free Spins that you can claim twice per day when you deposit as little as $25! Summer is the best time to rediscover yourself and rekindle that old flame with past lives. Perhaps you were a mermaid in previous summers and this July you have your chance to live it again when you hit the spin button of Mermaid Queen where scatter clams, pearls, free spins, tripled wins and more are just some of the joys this slot brings! Keep that mermaid spirit you have going throughout the summer and really get those toes in the water and bathe in wins when you deposit as little as $25 to play with up to 100 Free Daily Spins twice per day!